Dr. 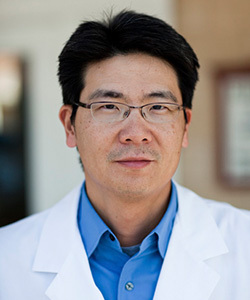 In Soon Park is a board certified general surgeon since 2002. He grew up in Jersey City, NJ. He obtained his Chemical engineering degree at Columbia University in NYC, NY in 1991. He graduated from Robert Wood Johnson Medical School, UMDNJ, in Piscataway, NJ in 1995. He did his general surgery training at Mount Sinai Hospital in NYC, NY and finished in 2000. After his residency, he became an assistant professor of surgery at Mount Sinai University and work primary at Elmhurst Hospital in Queens, NY until 2002. He moved to Long Island in 2002 and joined a private surgical group. He moved to Tampa, Florida in 2005 and joined Dr. Siegman at Suncoast Surgical Associates. He performs all types of gastrointestinal surgery. He has particular interest and expertise in laparoscopic and colorectal surgery. He has performed routine laparoscopic surgery (including cholecystectomy, hernia repair) to advance laparoscopic surgery such as adrenelectomy, splenectomy, colon and resection. He also has expertise in treatment of anorectal disorders, especially in treatment of hemorrhoids. Most of hemorrhoid treatments are performed in office with no or minimal pain.